Board a high speed vessel for a Gastineau Channel crossing, passing Mayflower Island and Suicide Falls, with a beach landing at the remote Treadwell Mine site on Douglas Island, with direct access to the forest outfitting base camp. Your professionally trained guides will outfit you with state of the art safety equipment and provide a detailed safety briefing before transporting you in a 4 x 4 Unimog all-terrain vehicle up the densely forested hillside to the first zipline tree platform. This is your introduction to nearly a mile of dual high tension cables linking a network of platforms mounted high in carefully selected old growth spruce trees. 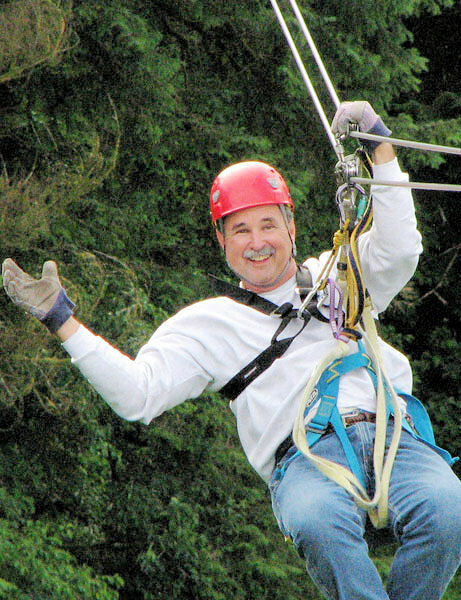 Your guides will progressively ease you into the forest canopy along ten zip lines. Cross two aerial suspension bridges, with breathtaking views of spectacular Bullion Creek, and enjoy unique views of Juneau from the treetops. Discover hidden ruins of the historic Treadwell Mine (1881-1917), which was once one of the world's largest gold mines, and zip over a 150 foot deep glory hole. Looking from above, see the ruins of the original mine refinery, where millions of dollars of molten gold were poured into ingot molds. You will be surrounded by the sights and sounds of Alaska's rainforest throughout this award winning nature-based adventure. The last zipline takes you to a final platform to experience the thrill of rappelling into base camp, where you will receive a light snack and be presented with a custom cast Alaska Canopy Adventures medal in recognition of your achievement. An informative narration is provided on the channel crossing. All necessary gear including harnesses, helmets, lanyards, gloves, and rain gear is provided. Complimentary snack, coffee, tea and hot chocolate in general store. Min. height 60", min. weight 90 lbs., max weight 250 lbs. General good health, no history of back or neck injuries, full use of all limbs, no history of seizures, comfortable with heights, not pregnant, able to communicate and understand directions in English, must fill out a waiver. Wear layered clothing and closed toed shoes.